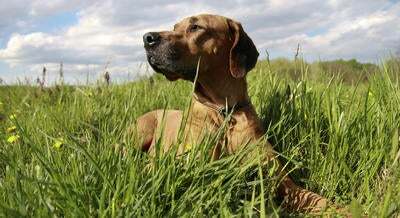 What is Lyme disease and how to I protect my dog? With the weather warming up, allergies are making a comeback and the bugs are starting to show up everywhere so that means it’s time to prepare for any springtime illnesses your pet may be at risk for. Spring weather means that the pesky tick season is upon us once again so it is time to start discussing with pet owners how to protect their furry friends from lyme disease. Though it is recommended to be on monthly flea and tick prevention, Lyme disease is one of the most common tick-transmitted disease in the world, and can affect dogs of any age, size or breed. So what is lyme disease? Lyme disease originated in 1975 in Lyme, Connecticut, and predominantly seen on the Pacific coast and in the Midwest and Atlantic coast states. The bacteria is carried through the infected Ixodes Tick, commonly referred to as the Deer Tick. These ticks like to hide out in wooded areas, tall grass or bushes. Usually, but not always, the infected tick must be attached to your dog for at least 12-24 hours for the infection to occur. However, if your dog had been bitten by an infected tick, symptoms may only start to develop 2-5 months after the tick bite. These symptoms include lameness in the legs, swollen joints, lethargy, fever, and enlarged lymph nodes. The disease cannot be transmitted from one dog to another or to humans, it can only be transmitted from an infected tick bite. The best way to prevent Lyme disease is to put your dog on a strict tick control regimen and check your dog as thoroughly as you can after each walk. If you do find a tick be sure to use gloves and tweezers to remove it. If that tick is infected you want to be sure not to get any of the blood on you or others. Hold your tweezers as close to your dogs skin as possible so that you can grab onto the ticks head. You want to pull up on the tick with steady pressure: Do NOT jerk or twist. You want to ensure that the head does not break off into the skin during removal because it could increase the risk of infection. Once you’ve successfully removed the tick, clean the bite area with soap and water. If you are not sure how to take the tick off, feel uncomfortable doing so, or may have been unable to remove the tick’s head, please take your dog to your veterinarian to have them remove the tick as soon as possible. There are different choices when deciding which monthly flea and tick prevention plan you want to have your dog or cat on. There are collars, oral medications, and topical prevention, which is applied to the skin in-between the shoulder blades. Every product is not created equal and every pet is different. If you are unsure of which type of prevention is best you can always consult with your veterinarian. Along with monthly flea and tick prevention, there is a Lyme vaccination that your veterinarian can administer to your dog during their yearly wellness exam. Although ticks are known to be active during spring and summer months, you want to check for ticks in fall and even at the end of winter when the temperature starts to rise. During yearly exams you can talk to your veterinarian to learn more about the Lyme vaccination as well as a Snap test to check for heartworm, Lyme, and other tick-borne diseases. Understanding where this disease comes from, how to prevent it, and the symptoms associated with it will help keep your furry friend in the clear to enjoy the warm weather!